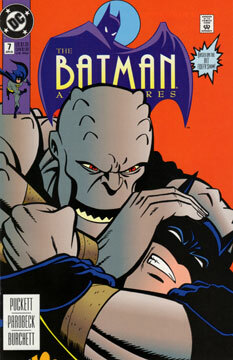 The story opens with Batman searching for a new gangster in town named Mandrake. Meanwhile, Killer Croc is cleaning up in the underground wrestling circuit. Croc learns that Mandrake has brought his own fighter to challenge Croc named the Masked Marauder, who beat Croc years ago. Batman tracks down Tommy Two-Bits, who leads him to Mandrake at the next wrestling match. Croc almost bails on the match, but his trainer convinces him to go on. Batman confronts Mandrake at the match, while Croc fights the Marauder. Croc goes down, and the Marauder goes after Batman. The Marauder has Batman on the ropes, when Croc recovers and takes down Marauder, saving Batman. Mandrake is caught, and Batman and Croc part ways. I very much enjoyed this story! We see loads of new mobsters, and we get to see Croc not be an idiot (always a pleasure). And to see Bats and Croc respect each other in the end without fighting was a delight. This would have made a great episode. Parobeck is here! This is the first issue penciled by the late, great Mike Parobeck. His own cartoon style blended extremely well with that of Bruce Timm’s. And yet, you can always tell a Parobeck piece of art as his own. The man was an underrated master, in my opinion. His art always made an issue feel like one of the better animated episodes.